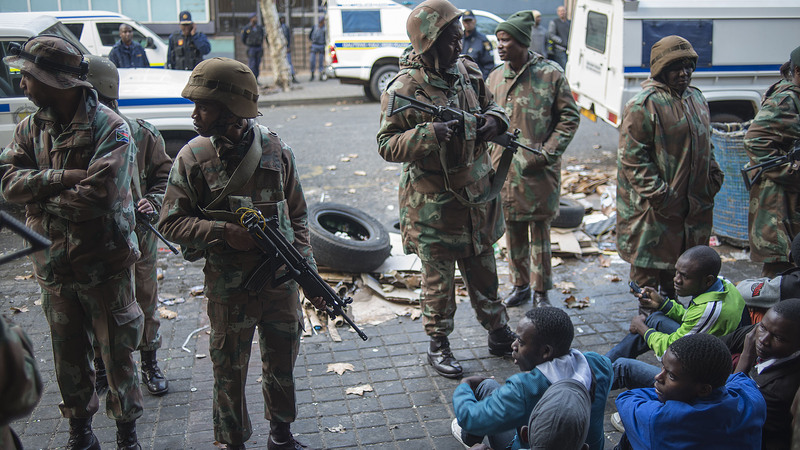 Human rights lawyers are interviewing hundreds of migrants rounded up last week in night raids by South African police, trying to ascertain if they should be exempt from deportation. The raids form part of a government operation launched by an inter-ministerial task team on migration set up in the wake of a wave of xenophobic attacks last month on foreign workers. The anti-foreigner violence left at least eight people dead and drove more than 5,000 people from their homes and businesses. It has already been established that 11 of those detained are asylum-seekers with claims pending, fuelling accusations that the government campaign is wrongly targeting migrants and stoking xenophobia rather than tackling it. 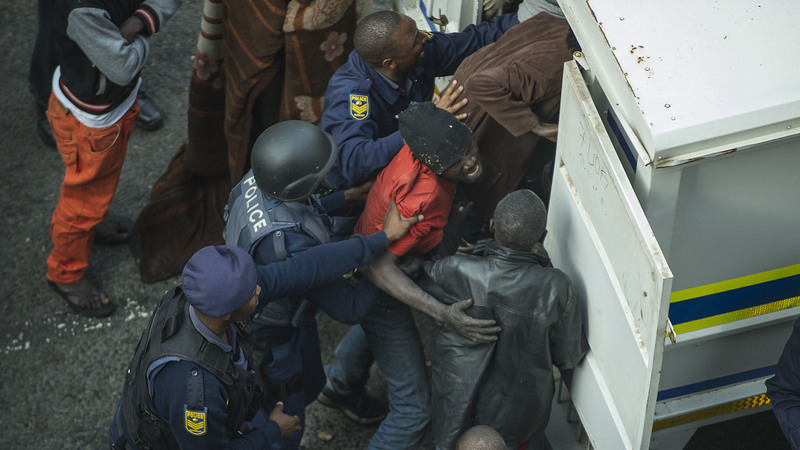 Ostensibly, Operation Fiela (meaning “sweep out dirt”) is aimed at combatting crime, but the vast majority of the more than 800 people detained during the nationwide operation were arrested on suspicion of immigration violations. Detainees are being held at police stations and at the Lindela Repatriation Centre on the outskirts of Johannesburg. A holding centre for irregular migrants awaiting deportation to their home countries, Lindela has been embroiled in controversy since opening in 1996. Detainees complain of overcrowding, staff brutality and a lack of access to legal representation. Until Thursday, they had been denied access to legal representation, “a clear violation” of their constitutional rights, according to Wayne Ncube of NGO, Lawyers for Human Rights (LHR). Among the buildings in Johannesburg raided in the early hours of Friday morning was the Central Methodist Church, a well-known sanctuary for migrants and asylum seekers with no other shelter. According to Lizzy Mambu, who has lived at the church since fleeing political violence in Zimbabwe several years ago, gun-toting police entered the church at 4am shouting obscenities such as "kwekwerere" – a derogatory term for foreigner. “Some people didn't have time to take their money, their documents, their medicine,” said Mambu, who managed to evade arrest despite having out-dated asylum papers. Operation Fiela has rounded up at least 800 people, the vast majority of them migrants, since its launch last month. LHR has described Operation Fiela as “a show of institutionalised xenophobia” and on Tuesday secured a court order deferring deportations of those arrested during the raids that took place across Johannesburg’s city centre on 8 May, including the one on the Central Methodist Church. LHR’s lawyers now have two weeks to consult with the detainees to determine if they have asylum claims pending that would exempt them from deportation. Under South Africa’s Refugee Act, a person who has applied for asylum cannot be deported until a final determination of their refugee status is made. In South Africa, this is a process that can take several years as the Department of Home Affairs has a significant backlog of applications. Sending genuine asylum-seekers home without due care could result in them facing persecution or torture, said Ncube. During a media briefing on 12 May, the People’s Coalition Against Xenophobia, comprising of a number of civil society groups including LHR, demanded an immediate end to Operation Fiela. Migrant communities are being compared to rubbish at the same time as the government is declaring itself as tackling xenophobia. “Migrant communities are being compared to rubbish at the same time as the government is declaring itself as tackling xenophobia,” said Stephen Faulkner, spokesperson for the Congress of South African Trade Unions (COSATU), which forms part of the coalition. “To equate crime with the presence of undocumented people in our country is not tackling xenophobia; it's legitimising it,” he added. The government has denied claims that the massive operation –involving the police, the army and the Department of Home Affairs – is targeting foreigners and insists its aim is to tackle criminality. "If you are in the country without documents, it's a crime and you are a criminal," said Mayihlome Tshwete, a spokesman for Home Affairs. Bishop Paul Verryn, who was in charge of the Central Methodist Church until December 2014 and was instrumental in turning it into a sanctuary for destitute foreigners and South Africans, also condemned Operation Fiela. “It's part of a very specific political strategy and sends a very clear message to the entire nation that these people are illegitimate if not criminal cases,” he said. April’s attacks on foreigners – mainly Zimbabweans, Somalis, Malawians, Mozambicans and Nigerians – erupted in Durban following comments by Zulu King Goodwill Zwelithini suggesting that African migrants in South Africa were criminals who should go back to their countries and stop stealing jobs and opportunities from locals. Guateng Premier David Makhura has agreed to facilitate a meeting between the People’s Coalition Against Xenophobia and the government’s inter-ministerial committee on xenophobic violence next week.